Urbanspace Vanderbilt is one of many food halls in New York City that have become foodie destinations. The momentum of the food hall phenomenon appears unstoppable, even as the concept struggles through some growing pains. The rush to develop new halls in markets around the country has led to some miscues. TV chef and adventurer Anthony Bourdain, for example, recently pulled out of a massive, high-profile project in New York, and other halls have reportedly turned out to be challenging for the vendors financially, despite the promise of low start-up costs. The food hall concept is evolving in different directions, however. Some are run by a single owner and operator, in the style of Eataly, the Italian-themed retail-restaurant conglomeration. The format gives restaurateurs more creative control over the space, with room for partnerships with potential outside retailers. Others serve as collective spaces for multiple foodservice operators, with a focus on careful vetting and nurturing of the concepts they bring in to ensure mutual success. Among the newest restaurateur/developer concepts is Lincoln South Food Hall in Bellevue, Wash., led by veteran Las Vegas restaurant developer Jeffrey Frederick, founder of Elite Brand Hospitality Group. The location, which was expected to open in early 2018, includes several unique restaurants developed by Frederick and his culinary team, in partnership with local investors Ascend Hospitality Group. Having control over all of the concepts, Frederick said, will help him build a significant presence in the market, where he did not yet have any operations. He developed the concepts — which include pizza, tacos, bao, sandwiches, burgers and poke — so that each would offer a distinct eating experience, which is an essential element of the food hall experience. “Some might look at it as too ambitious, but I look at it as being in my wheelhouse to bring a number of unique and different style restaurants because of my background,” he said. Frederick’s background includes working on some of Las Vegas’ top restaurants, including Nobu and Mr Chow, and other work with several Michelin-starred chefs. He’s partnering with locally based Ascend Hospitality Group on the Bellevue project. Having control over the design of the facility is another advantage Frederick sees in overseeing the whole operation. Food Hall operators who bring multiple outside foodservice vendors into their operations said it’s important to work with them closely to ensure that they succeed. 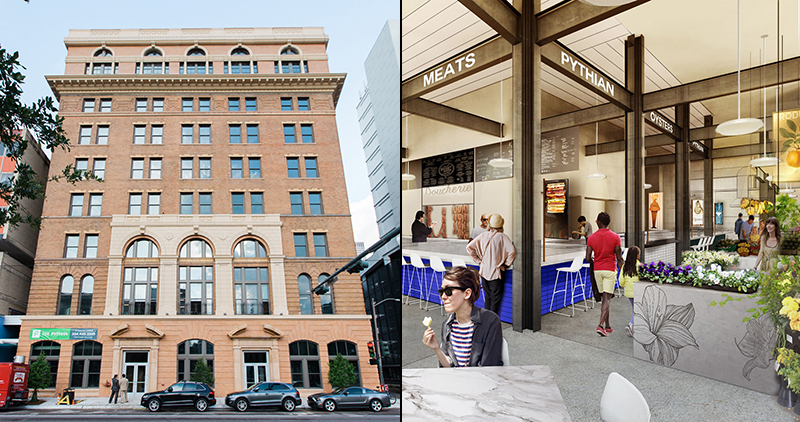 Lisa Brefere, CEO of consulting firm Gigachef and partner in Pythian Market, a new food hall opening in New Orleans, said it’s important for food hall operators to be transparent with their foodservice vendors about all potential costs at the outset. Brefere, a chef by training, had consulted with a foodservice operator at the Ganesvoort Market food hall in New York before joining the Pythian team. She said her experience has helped her work through potential issues with Pythian Market’s operators as the facility prepares to open. Pythian is also structuring its financial model so that operators only pay a percentage of their revenues on top of their base rent once they reach a certain sales threshold, according to Amy Chan, general manager of the market. “Our idea is that their success is our success,” she said. Justin Anderson, director of hospitality development at Zeppelin Places, which is opening the Zeppelin Station food hall in Denver, said one of the things he’s learned is to make the operation as simple and transparent as possible for the vendors by bundling all the shared costs together in a single monthly bill. “We think that fully allows the independent vendors to concentrate on the most important thing, and that’s delivering great hospitality, and concentrate on cooking the food and executing at a high level,” said Anderson. One of the challenges operators have faced in food halls, according to reports, has been surprise fees for services such as dishwashers and wi-fi access. Anderson said Zeppelin Station is taking a hands-on approach with its operators to help ensure that they will be successful. He also said operators need to have a “communal mindset” when they come into a food hall environment, since so many things are shared. Jared Leonard, founder and CEO of the Stone Soup Collective, a Chicago-based restaurant group, opened a concept in Chicago’s Revival Food Hall — where Anderson previously worked — and is expanding to Zeppelin Station. “I think like anything in life, it doesn't come without its challenges, but for a good operator that has a good brand and a clear idea of what running a food service business is, food halls are really a perfect setup,” said Leonard. He said the collective maintenance and other fees make it very simple to operate in food halls, even though it may translate to a higher rent per square foot than a brick-and-mortar restaurant. In Revival Food Hall, Leonard opened what has become one of that venue’s most successful operations, a chicken-sandwich concept called Budlong Hot Chicken. In Zeppelin Station, he’s opening a new concept called Au Feu, which will focus on Montreal-style smoked meats and other specialties of that region. Leonard said the food hall environment allows him to focus on providing a high-quality product. Leonard said he’s found food halls to be a low-risk option that have made it easy to expand his brand. Zach Friedlander, managing partner at Aloha Poke Co., which is also opening at Zeppelin Station, opened his first Aloha Poke restaurant inside a 150-square-foot space in Chicago’s French Market, which offers a mix of specialty retail and grab-and-go foodservice. One of the key concerns several food hall operators and restaurateurs cited was storage. Friedlander said he only had enough cold and dry storage space at one early food hall location for about 70 percent of each day’s needs. Dry storage is also important to consider, Friedlander said. He had to change the bowls he was using because they came in a 600-count box, and he simply did not have the space to store them. He switched to a bowl that came in a 200-count box instead, he said. The confined space in a food hall stall also forces operators to make sure their systems and processes are as efficient as possible. Leonard of Budlong Hot Chicken said he cross-trained all his workers in the food hall location in Revival Hall to perform all of the jobs, so that he doesn’t have to have a specialized cashier on hand who can’t help out making sandwiches, or a cook who can’t work the POS system. It also helps to have a highly streamlined menu and presentation, said Leonard. It’s critical to have the operation running as efficiently as possible because, operators note, the competition is only a few steps away at the neighboring stall, and customers can see right away if the line next door is moving faster. Workers also have to be cognizant of the fact that they are working in view of an audience at all times — something back-of-the-house employees might not be used to — because customers may notice unprofessional behavior and opt for the stall that appears to have its act together instead, Leonard said. “You’ve got to be as good or better than the next guy,” he said. Brefere of Pythian Market said it’s important for operators ask as many questions as possible before they go into a food hall. In addition, she said, operators should make sure all these expenses are documented. Any additional expenses that arise would need to be approved collectively by the group of operators. Aaron Allen, an Orlando, Fla.-based restaurant consultant who has worked with both domestic and international food halls, said that while there are some challenges for operators that are unique to the food hall environment, many of the challenges are are similar to traditional restaurant operations in terms of calculating costs accurately. “When you get a bunch of operators together and from different backgrounds and you ask them to work together in harmony, you can get can get some feelings of unfairness, just like if you had 30 parents at a PTA meeting,” Allen said. Some of the problems related to fairness that can arise are similar to those in mall food courts, he said — arguing over visibility, for example, or excessive sampling. Overall, Allen said he sees the food hall environment as a positive for operators, especially those with a niche concept. Operators should be conscious of many of the same variables they must consider when entering a food court, he said, such as differentiation from other concepts in the space, and understanding how shared expenses are allocated. 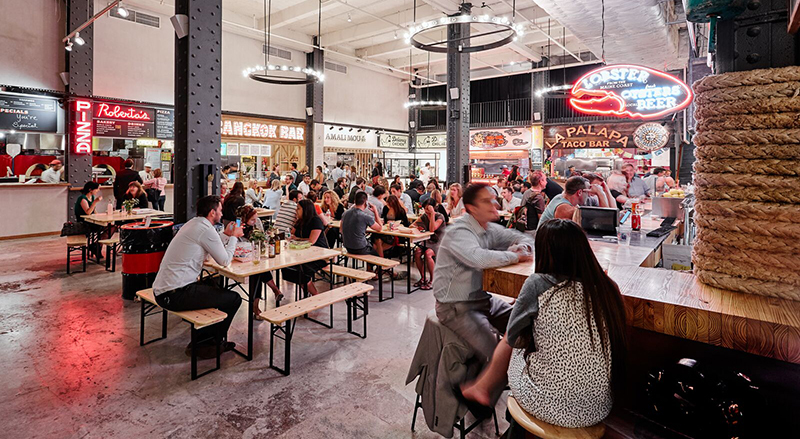 For operators with a strong product but little experience, food halls present a low-cost entryway to operating a business, while for more experience operators a food hall venue can serve like a marketing vehicle to showcase certain products.